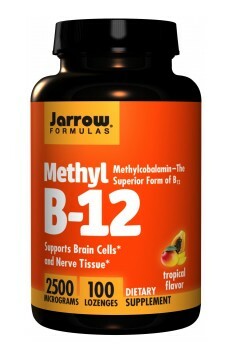 Jarrow Formulas Methyl B-12 is a perfect supplement with 1000 µg of methylcobalamin, a biologically active form of vitamin B12, in a capsule. The substance participates in a stunning number of physiological processes, necessary for the organism's normal functioning. It supports the nervous, circulatory, haematopoietic systems, has a positive effect on the mood, cognitive functions in the brain as well as fat and carbohydrate metabolism. The preparation contains a powerful dose of methylcobalamin - a cobalamin derivative that exhibits the ability to cross the blood-brain barrier. It is also characterised by higher bioavailability than another popular compound of the vitamin - cyanocobalamin. A natural source of vitamin B23 are foods of animal origin (meat, dairy products); therefore, vegans and vegetarians are a group of particularly high risk when it comes to B12 deficiencies. The nervous system has an essential, superior role in maintaining the normal functioning of the organism. Scientific studies showed a long time ago that methylcobalamin is essential for its normal activity. It is a donor of methyl groups in the process of protein methylation in the central nervous system, participating in the formation of neurolemmas which protect neurons from damage and determine their normal functioning. It also stimulates the production of neurotransmitters - the substances responsible for transferring information among different cells of the system. Homocysteine, a derivative of the amino acid of methionine, is a substance created naturally in the organism. Scientific studies have shown that it constitutes a risk factor of atherosclerosis development, which can cause many dangerous diseases. Researchers have proven methylcobalamin's ability to reduce the level of homocysteine in the organism. By participating in tetrahydrofolic acid synthesis (active form of folates) and cooperating with it, it leads to the remethylation of homocysteine back to methionine. That can significantly reduce the risk of many dangerous diseases of the cardiovascular system. Erythrocytes (red blood cells) and haemoglobin present in them are responsible for transporting oxygen from the lungs to all tissues in the system. Too small a concentration of erythrocytes or haemoglobin can lead to a group of diseases called anaemias. The presence of methylcobalamin is necessary for the normal maturation of precursor cells of erythrocytes and for the synthesis of haemoglobin itself. Therefore, it enables the normal oxygen distribution in the organism and prevents anaemia. Methylcobalamin can also contribute to the improvement of the mood, the stimulation of brain functioning and the reduction of fatigue. That is probably thanks to its activity in nerve cells which enables their normal functioning and stimulates their growth. The stimulation of neurotransmitter synthesis is also of great significance. One of the neurotransmitters is serotonin - commonly known as the "happiness hormone"
The DNA is a carrier of our genetic information, which is indispensable for the functioning of the organism. Vitamin B12 has been proven to participate in DNA metabolism by transforming purines and pyrimidines. It also indirectly affects the stabilisation of the genome. Studies have shown that B12 deficiencies caused an increase in DNA damage, which can lead to the formation of neoplasms. To sum up, Jarrow Formulas Methyl B-12 is a unique dietary supplement with a large dose of methylcobalamin, which has various healthy properties. It is aimed particularly at people who want to ensure the normal functioning of their nervous and circulatory systems. It is also recommended for those prone to anaemia (vegetarians, vegans). Thanks to the capability of normalising homocysteine concentration, it can also prevent cardiovascular system diseases.